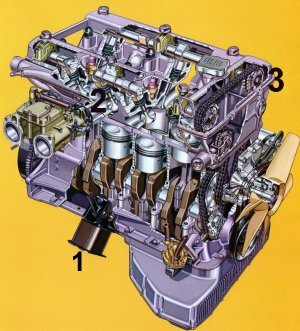 The Zagato's twin-cam four-cylinder engine is a well proven unit in production since over 40 years and an area not to worry about that much if you can see a maintenance history and look for traces of sympathetic ownership like silent timing chains and tappets. Oil changes should have taken place on a regular basis every 10.000 km. Open the radiator filler cap and check for two things: Is there anti-freeze for its corrosion inhibiting properties in the cooling system and can you see mayonnaise - yes, mayonnaise! Of course not the one you like to have with your sandwich but I refer to a water oil emulsion which forms in the cooling system when the head-gasket is blown. Blue exhaust gas during start-up is a sign that a cylinder head overhaul is due, whereas traces of oil from the breather tube in the air cleaner indicates engine wear. The oil pressure gauge needle should sit at last at the halfway mark and should not fluctuate when the engine is under load and hot. It always drops when engine is idle. Please bear in mind that the engine needs approx. 8 liters of oil, double the amount of a contemporary compact car engine. Please allow the engine and oil to become warm before pushing the pedal too much. 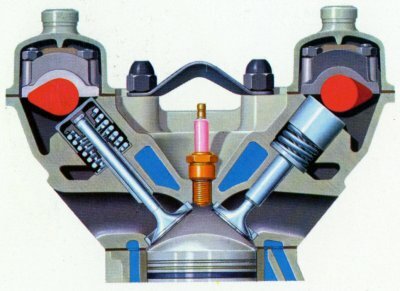 This is important and if you follow my hint you will have long lasting fun with your engine. The engine mounts (No.1) are made of rubber which can deteriorate and cause the engine-fan to crash with the radiator or with the hood. This is especially the case with the non-standard 2000ccm engine which fits very tight underneath the hood. The carburettor rubbers (No.2) are another point of interest because they tend to age and cracks in the rubber allow air to bypass the carburettor. If that is the case the engine will die of overheating caused by meager-mixture. With the engine running idle try to press the air-cleaner box together with the carbs up and down - if you observe changes in the idle speed the rubbers are due for exchange. The DOHC-engine is made of aluminum with cast iron wet innerliners - a possible source for corrosion if the already mentioned anti-freeze is not in the cooling system. Sometimes I hear that you should use only de-mineralized water to fill the system. Some chemo-wizards can even explain why, but experience shows if you use tab water and anti-freeze you are on the safe side. In cold areas of the world anti-freeze is protecting the engine against cracks caused by ice. Typically you will find cracks around the oil pressure sensor and around the spark-plug threads in the cylinderhead if the engine had no anti-freeze.